New price just announced!! Make an offer and we'll do our best to make it work for all parties!! Downtown condo at The Brio.....Pristine 2 bedroom/2 bath condo with sweeping city views from a its expansive 3rd floor balcony + storage closet. This unit is in EXCEPTIONAL condition and loaded with extras including an office/study nook w/wainscoting and 2 ample sized bedrooms with lots of closet space. Great open kitchen, living room, dining area with granite, custom cabinetry, SS appliances and large eat-at island. You're going to love this kitchen which boasts lots of cabinets and counter space to prepare great meals at home. Also, note the kitchen has tile floors and living area is hardwood flooring. Fabulous space for entertaining family and friends. Easy access to Cleveland Park, The Swamp Rabbit Trail and within walking distance to countless shops and restaurants downtown. Enjoy the Augusta road area amenities or pop over to Flour Field for a baseball game. 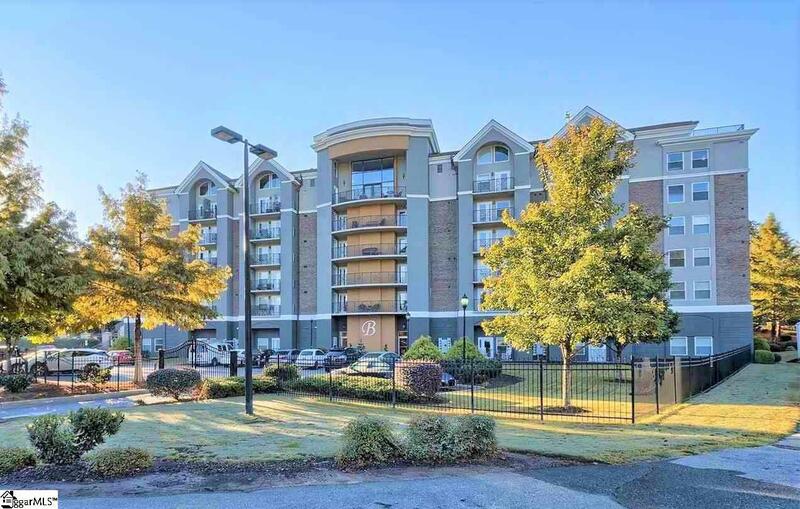 This complex is also in close proximity to GHS and St Francis healthcare. Take a swim in the pool or workout in the onsite fitness facility. Gated parking + guest parking available. Listing provided courtesy of Buddy Huffman of Keller Williams Grv Upst.